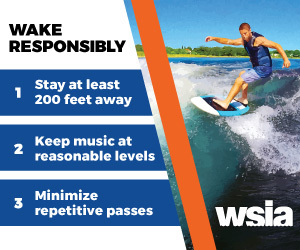 Sales of ski boats rose 10.3 percent to 972 and jetboat sales gained 16.3 percent to 506. Kloppe said the ski boat and jetboat categories don’t produce the numbers that fiberglass outboards and the two aluminum categories do, but “we’re still seeing demand for those boats and we’re seeing those numbers climb. Led by fiberglass outboard and aluminum fishing boats, the recreational boat industry regained its footing after a slip in May and returned to moderate sales growth in June. Builders and dealers also got a boost from two bigger-boat categories — 31- to 40-foot cruisers and 41- to 62-foot yachts — as sales rose 4.9 percent to 16,202 boats in the main powerboat segments and 4.1 percent to 27,200 boats industrywide in 28 states that represent about 68 percent of the U.S. market, Statistical Surveys reported today. Sales for the year through June are up 5.6 percent in the main segments and 5 percent industrywide in the early-reporting states. In May, sales in the main segments and industrywide dropped during the same month for the first time since February 2014. The fiberglass outboard category led the gain in the main segments in June. Sales rose 10.8 percent to 4,572 boats from the same month a year earlier. Sales of aluminum fishing boats climbed 6.4 percent to 3,536. 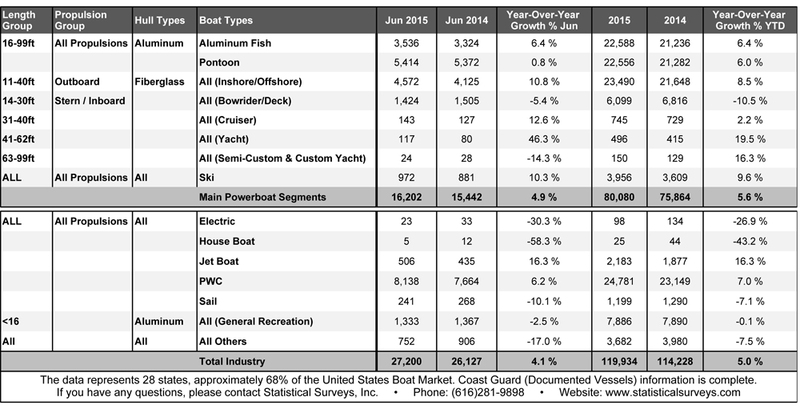 Aluminum pontoon boat sales were up only 0.8 percent, but the total was a healthy 5,414 boats, the most sold in any category among the main segments. In the bigger-boat categories, sales of 31- to 40-foot cruisers rose by 16 to 143 and sales of 41- to 62-foot yachts climbed by 37 to 117. Among smaller vessels, sales of personal watercraft rose 6.2 percent to 8,138. Florida, as usual, was the sales leader among the early-reporting states, reporting 3,487 sales, up from 3,140 in June last year. Texas reported 3,045 sales, up from 2,911, and Michigan reported 2,634, down from 2,801. The rest of the top 10 were: Minnesota (1,654, down from 1,965); New York (1,603, down from 1,825); North Carolina (1,515, up from 1,286); Alabama (1,373, up from 1,176); California (1,178, down from 1,219); Tennessee(1,119, up from 785); and South Carolina (1,101, up from 997). Sailboat sales fell by 27, or 10.1 percent, to 241, and they are down 7.1 percent to 1,199, through June.